What’s not to like? Fresh-baked bread–right out of the oven–some kind of sauce, a lake of molten cheese. There are umpteen different things you can throw on top for more flavor–and each one has its defenders and cynics–but these are almost superfluous. Pizza–Hot, Fresh, & Delicious, as if the standard-issue paperboard box needed to remind us of it–is (unofficially) America’s national dish. Pizzerias are a classic formula that’s never needed to be updated–order a single cut for a quick lunch or a whole pie for a group dinner. They get dressed-up in fancy toppings and elaborate food narratives one day, but it still tastes great as greasy street food the next. 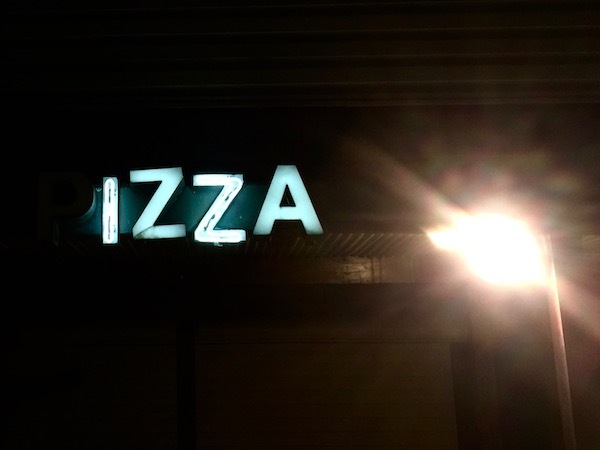 Pizza places are future-proof: utilitarian as gas stations and lusty as saloons. No one wants Internet pizza. All that said, not every pizza joint is going to have the long-term endurance of Beto’s or P&M. So on this Pi Day, we celebrate some of the fallen soldiers on pizza’s long campaign to win the hearts, minds, waistlines, and cholesterol counts of America. Buon appetito! The United States has no official “national dish”. The obvious rivals for this title–hamburgers, hot dogs, apple pie, and the like–could make strong counter-arguments, but this blogger thinks you’re fooling yourself if you buy them. 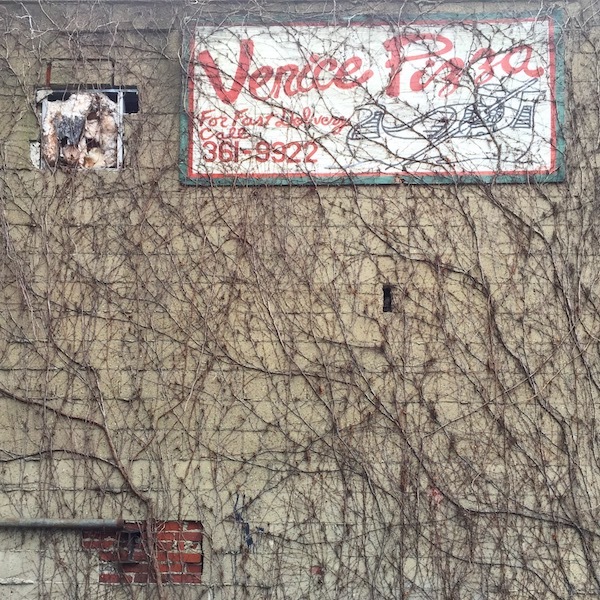 That’s Amore pizza now occupies this building, but the obvious paint-over of the Venice name still qualifies the original tenant as ghost pizza. 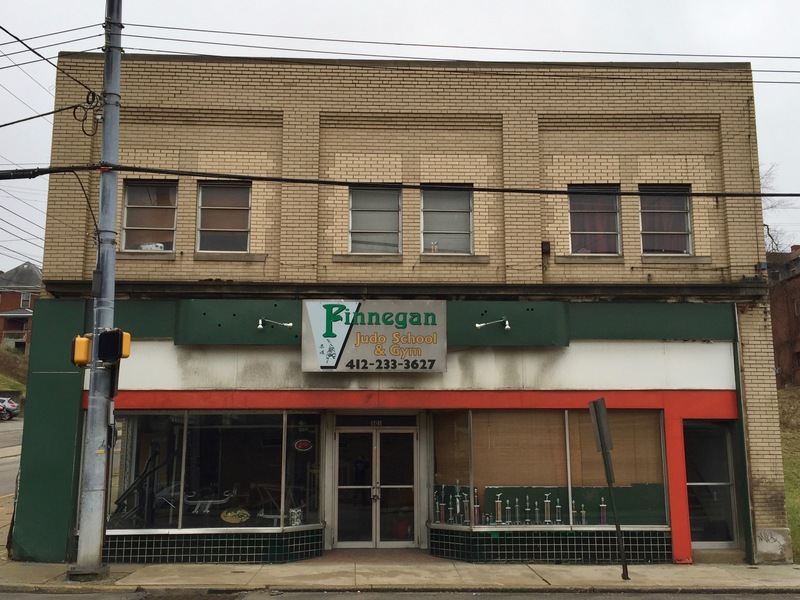 We can’t be sure the storefronts in Clairton and Monongahela were pizzerias, but the tell-tale green/white/red color scheme suggests they were either that or more full-on Italian restaurants. 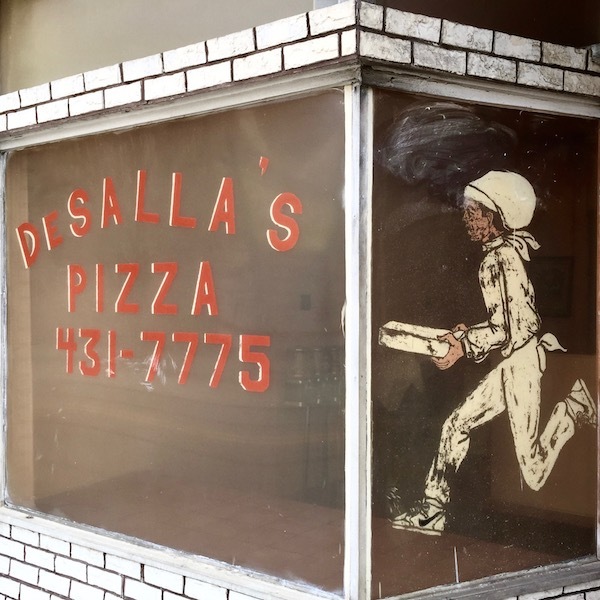 An Orbit reader from Allentown informs us that “DeSalla’s is not closed!” That may be true, but it sure looked like it the day we were there and they’ve got a prominent For Sale sign in the window, which suggests it won’t be long either way. American cheese. Have wars been fought for less? Probably. At least…maybe. 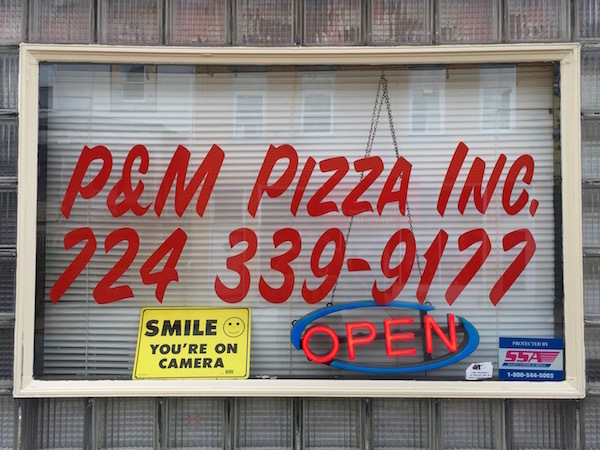 As far as we can determine, the story goes like this: The original P&M Pizza goes back to 1947 in Arnold. Owners Lefty and Mooney Martz ran the place for over fifty years before finally selling and retiring in the late 1990s. 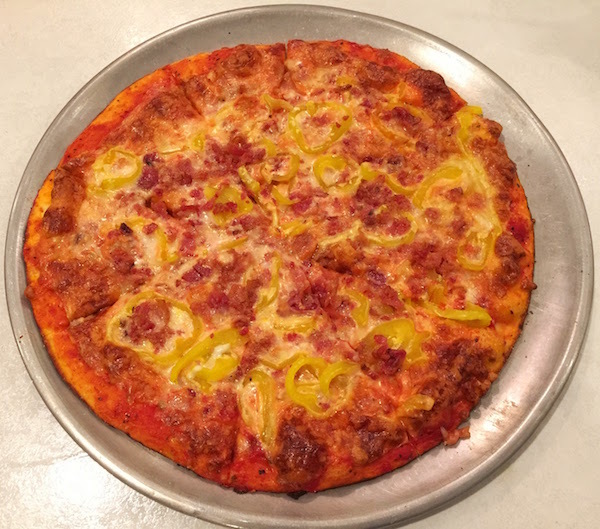 During that half-century, P&M became a landmark to locals with its unique pizza, distinctive in both crust and cheese blend (we’ll get to these). In the meantime, P&M was re-opened in the late aughts in the very same 5th Avenue building the Martz’ called home for half a century. 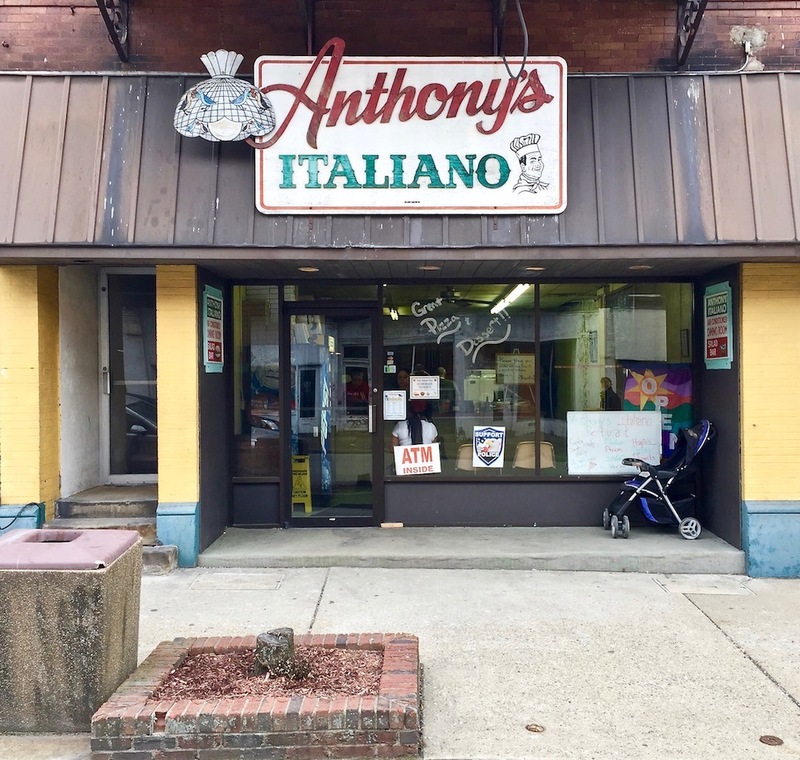 The new owners–a pair of Arnold natives–now claim to serve “The Original P&M Pizza” and they clearly want to take back the glory of what they believe is rightfully theirs. 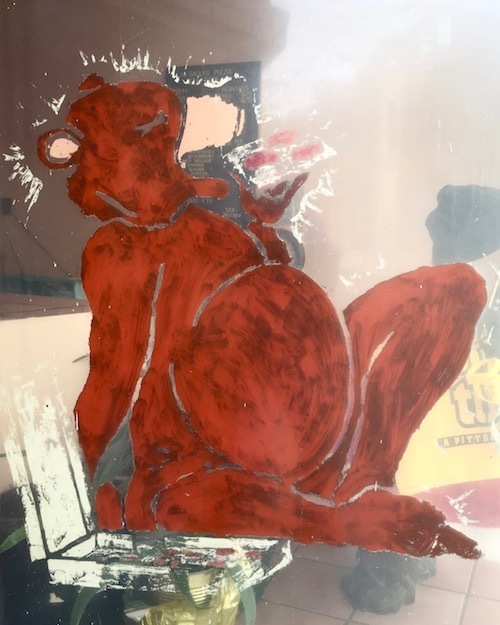 P&M’s web site features the crossed-out image of Phillippi’s cartoon pizza-eating chicken aside the text Leave it for the birds! P&M will also accept your (Phillippi’s) “Birdville Pie” coupons. 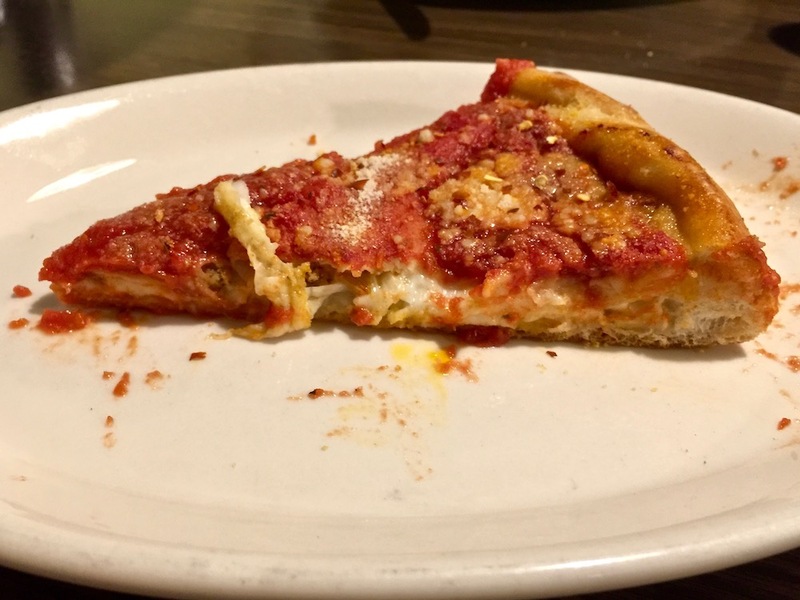 Coming late to the party, we’re just glad that there are two different establishments carrying the torch for micro-crust ambiguously-cheesed bar pizza located within minutes drive of each other. The Martz’ legacy–however approximate it may be–is alive and well. So how do the two pies stack up? It’s been almost a year since The Orbit checked in at Phillippi’s, so we’re running on pizza fumes here. That said, we can attest that the two pies are very similar–at least, to tastebuds from outside the Alle-Kiski Valley. The other thing that makes both places seem incomprehensible to all who didn’t grow up in greater New Kensington is the “proprietary cheese blend”. It’s electric orange and obviously contains some high percentage of American “cheese.” Now, we can get all snobby about our fromage, but gosh darnit if it didn’t taste absolutely gooey-great in the combination that P&M cooked up. Just editing the included photos is making this blogger hungry all over again. Wafer thin and golden orange: a single cut of P&M pizza. 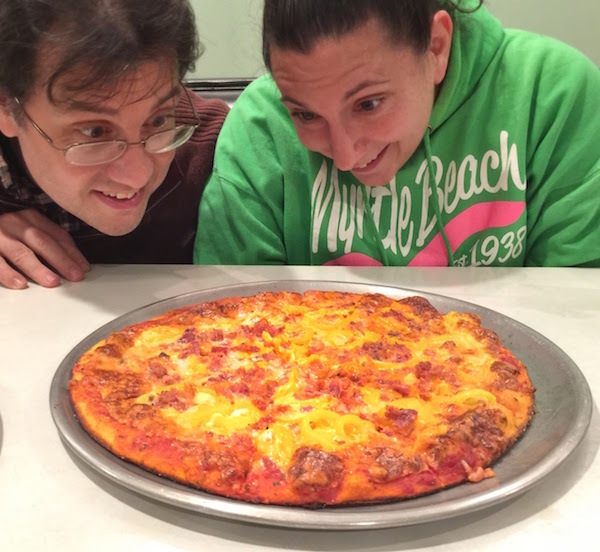 So which pizza gets the Orbit nod–P&M’s “original” vs. Phillippi’s “Birdville Pie”? We don’t want to disparage either establishment and it’s safe to say the two pizzas have a lot more in common than not. It’s also fair that both are definitely “acquired tastes” that you may have had to ingest in the womb to truly love. Curious outsiders: you’ve been warned. All that said, in our very unscientific experience, The Orbit‘s guests at Phillippi’s declared that while it was an interesting experience, they didn’t really ever need to have another Birdville Pie. I couldn’t talk any of the bunch into trying their cross-river rival for comparison. The same was not true at P&M, where the entire table (O.K. just two adults and one narrowly-converted youth) was ready to go back for more the next day. Advantage: P&M. 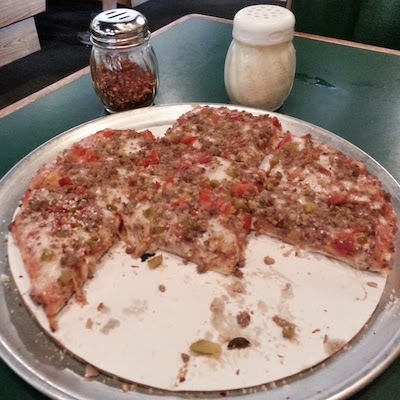 Check out The Orbit‘s first half on this two-part Pizza Chase story: Phillippi’s, Home of the “Birdville Pie”. American cheese, it is said, is neither American, nor cheese. 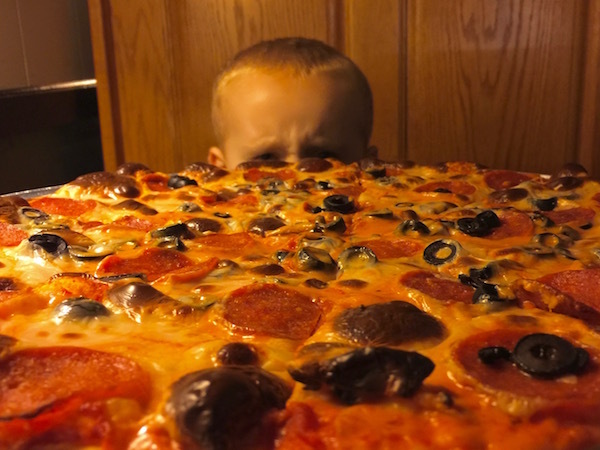 Some would also have us believe that this most maligned of processed foods has no place on that other great American culinary institution, the pizza pie. Those folks, however, don’t live in Birdville, and they don’t get their pizza at Phillippi’s. 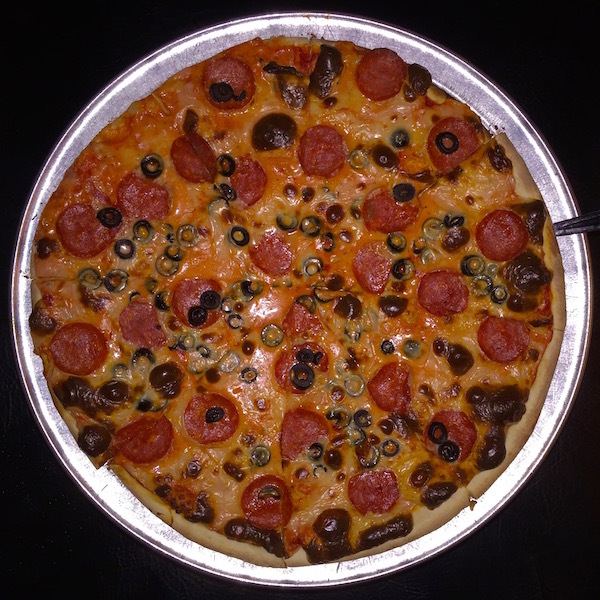 We don’t actually know for sure what that gooey stuff is on top of the Birdville Pie–Phillippi’s is famously tight-lipped about the “special blend of Birdville cheeses” they use. But between the radioactive aura it gives off and the weird molar-coating mouth feel, it’s pretty obvious that American cheese is the dominant sibling of this particular nuclear family. 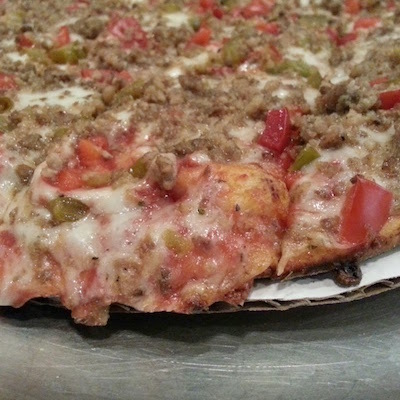 The pizza at Phillippi’s has one other major distinguishing factor. 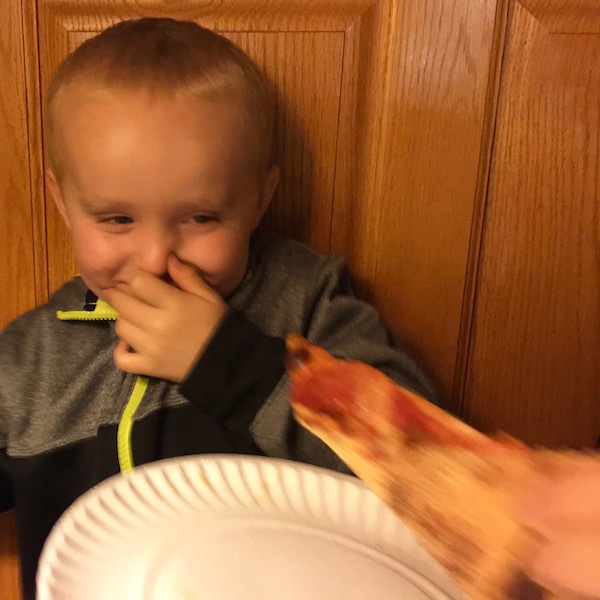 The crust is as wafer-thin as this eater has ever experienced. It puts the pie clearly in the camp of a meal that eats like a snack, or an appetizer, or, as one of our party derisively put it, “like a Lunchable.” Not that anyone left hungry, it just had the overall feeling of one big (processed) cheese and cracker. Someone at Phillippi’s really cares about local history. The walls of the Dining room are covered with great black and white photographs of Natrona Heights through the years. 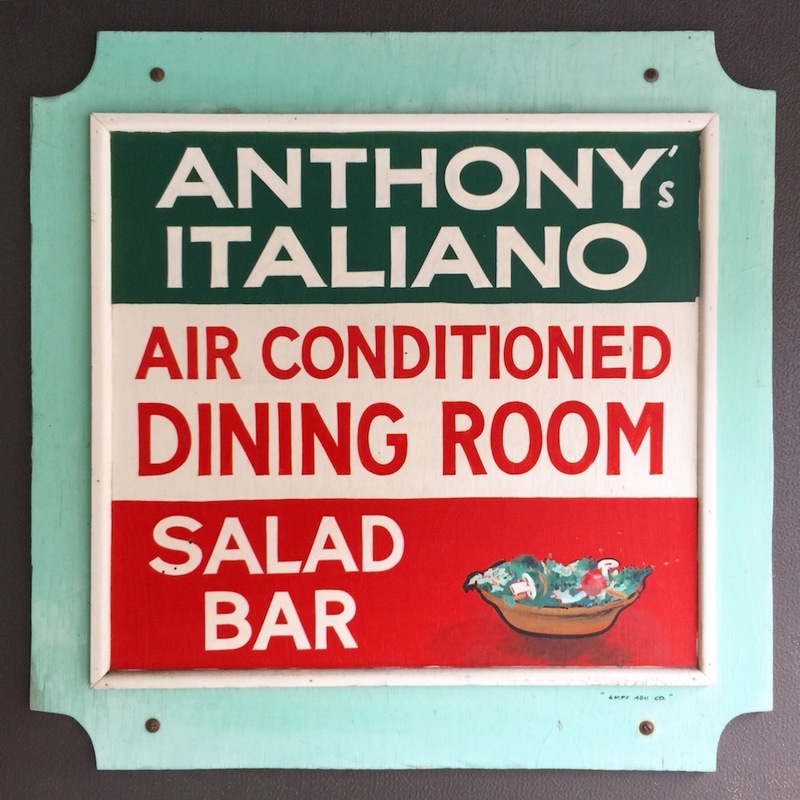 The restaurant’s web site has an extensive history–not of Phillippi’s (which is only mentioned in passing) or its namesake pizza pie (ditto)–but of Birdville, Pennsylvania. This time-is-money blogger will admit he didn’t read the whole thing, (to give you a sense of scale, there are forty-two footnotes) but we can tell you it goes from Frenchman Rene Robert Cavalier de la Salle fording the Allegheny River in 1670 to Rachel Carson and Silent Spring in 1962, and just about everything along the way. As generally happens with American cheese-related stories, this one is not without controversy. 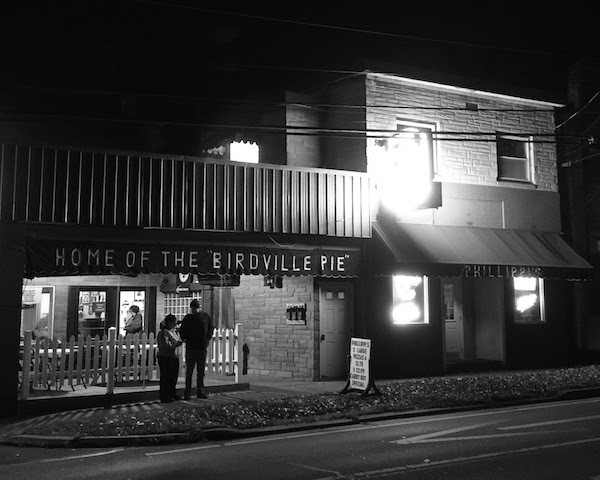 Any discussion of Phillippi’s and their unique pizza recipe would be incomplete without a mention of their cross-river rival and the authenticity of the Birdville Pie. This is something, we can assure you, that is as contested as the house of Romanov. That, however, must wait for another day, when the Orbit staff have had an opportunity to get the other side of this particular tale. As Dee Snider and the gang said so aptly, stay hungry. O.K. Ordering at Sir Pizza wasn’t quite like that, but I think it’s fair to say we were treated like some demi-royalty. Last month, when we introduced The Pizza Chase with Beto’s Pizza we made it clear we were looking for pizzerias that did things in some fundamentally different (though, not necessarily better) way. 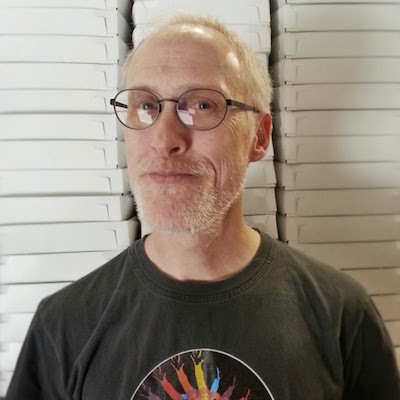 The people spoke, The Orbit followed-through, and below are our questions (if not yours) on Sir Pizza answered (and not) to the best of our ability. 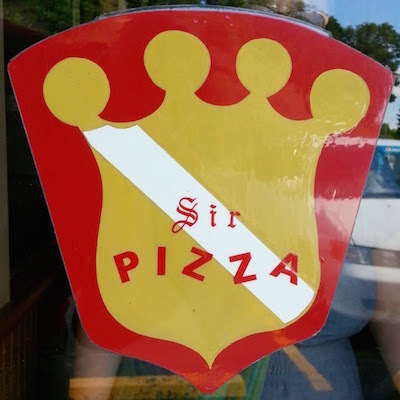 Is Sir Pizza a chain? Yes…wait: no…maybe? The Orbit‘s crack research team spent no small amount of time attempting to answer this seemingly-simple question and came to no definitive conclusion. 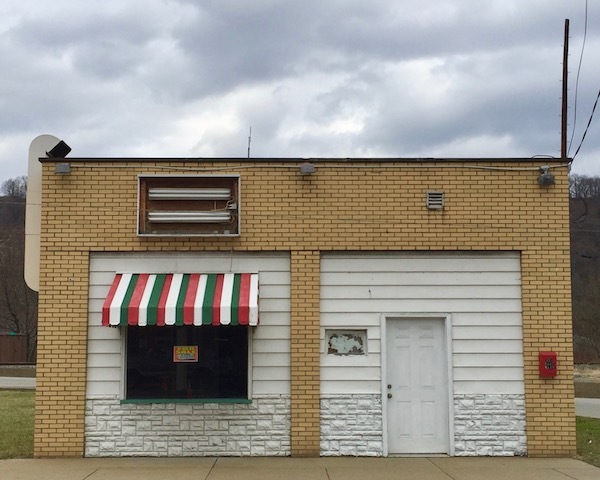 As far as we can tell, Sir Pizza started in 1957 in Indiana as Pizza King and operated as a chain up through at least the early 1990s. From there it gets hazy. 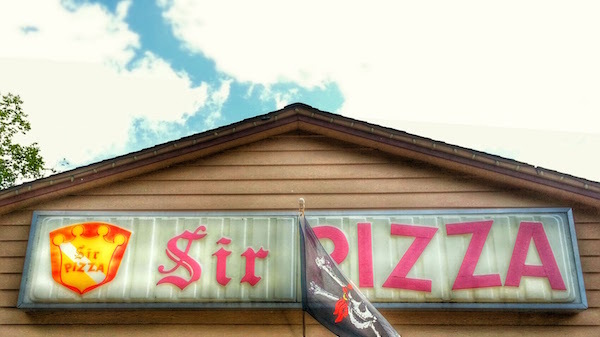 Sir Pizza-Pittsburgh has three locations–all in the North Hills. We visited the “original,” started in 1975 in Ross Township. 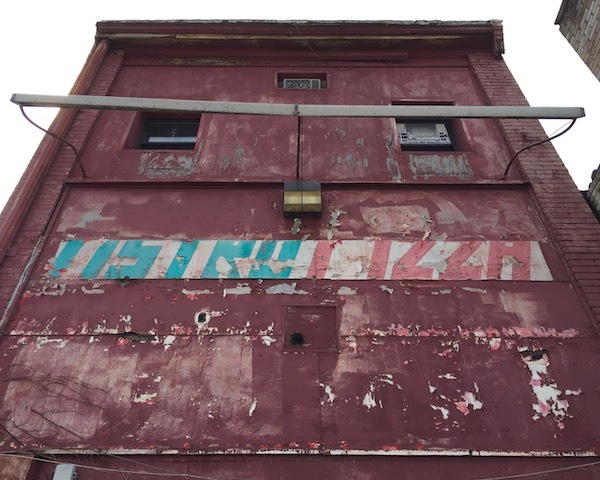 But a search for Sir Pizza reveals other similar shires scattered around the eastern half of the United States–two in Michigan, five in South Florida, some South Carolina chapters, an outpost each in Kentucky and Tennessee, etc. There seems to be no central dominion to which the individual restaurants pay tribute. The marionettes appear to have cut their own strings, leaving independent fiefdoms that may or may not resemble each other, but certainly don’t acknowledge any connection publicly. What’s with the whole ‘Sir’ thing? 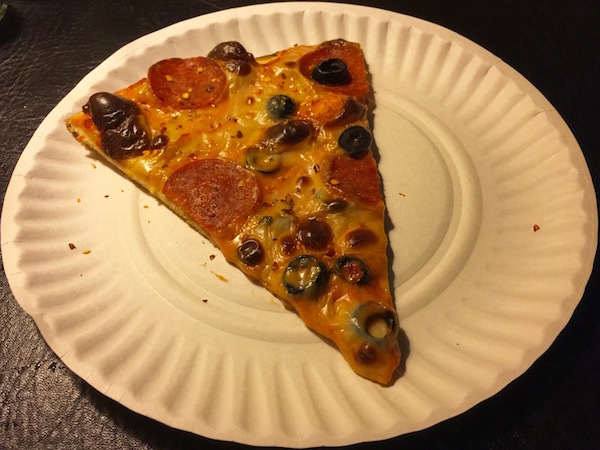 Is this medieval pizza? Another interesting ponderable with no clear answer. 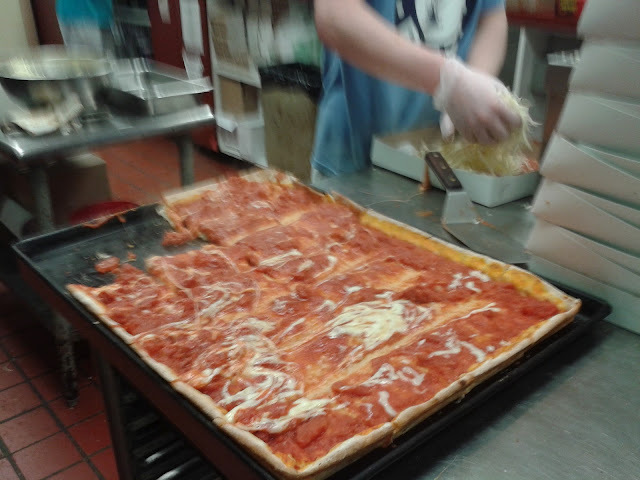 Sir Pizza’s commitment to the whole lords in sauce/knights of the round pie pan thing is shaky at best. 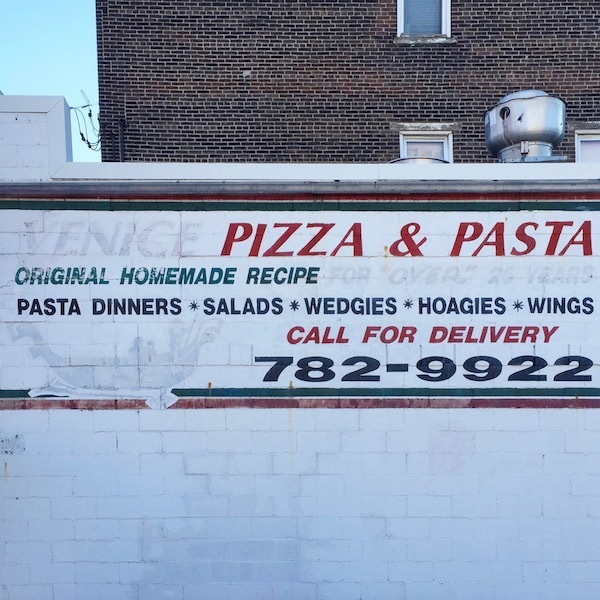 There’s the calligraphic “Sir” in the signage, the crest/shield logo, and a smiling cartoony knight tipping his armored visor on the menu, but other than that you’d swear you were back in any old suburban pizza parlor in a squat New World strip mall. Black and white photos of “la familia” take up one wall and nods to various local sports teams are positioned around the dining areas. 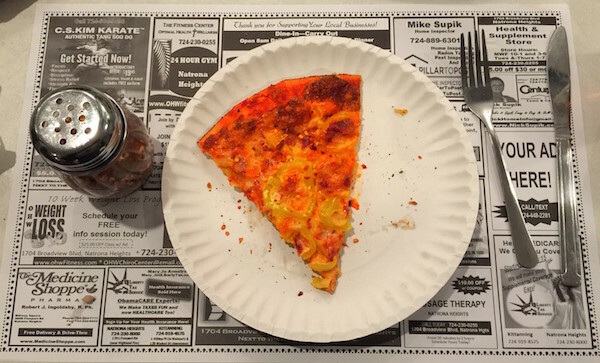 On decor alone, it could as easily be Italian Wedding Pizza, or High School Football Pizza. 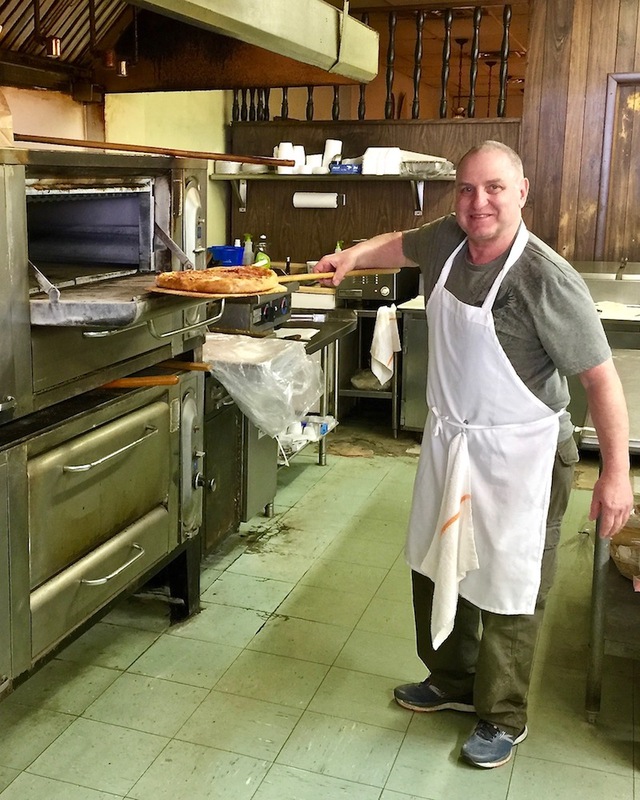 The only previous time this hungry blogger experienced Sir Pizza was years ago as payment for helping to move a giant 1970s-era recording console from Turtle Creek to the North Hills. “I almost died and you’re paying me with Totino’s?”, I asked. I don’t even remember if I got a beer out of the deal. [Bill: you (might) owe me a beer!] In retrospect, that assessment is a little harsh–but just a little. 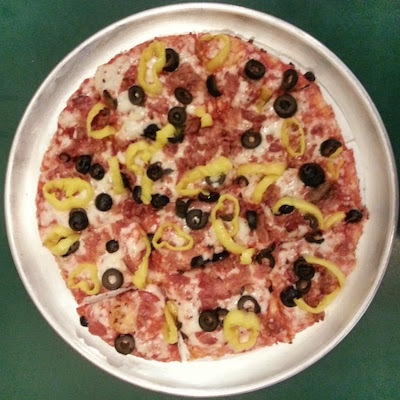 The pizza is on a thin, cracker-like crust with a reasonable layer of cheese and toppings. Sir Pizza claims they use special smoked provolone instead of mozzarella, but these layman’s tastebuds couldn’t discern the difference. The meat toppings, as well as the peppers and onions, were minced into tiny morsels, which again gave it that joie de congélateur allée. The pizzas are cooked and served on cardboard discs. Sir Pizza uses the tag line “Good to the very edge” which is a nod to the practice of running the sauce, cheese, and toppings all the way out to (and over) the pizza’s perimeter. It’s a nice gimmick, but I couldn’t help but think it’s really a mask for a completely uninteresting flat crust that wouldn’t survive on its own. 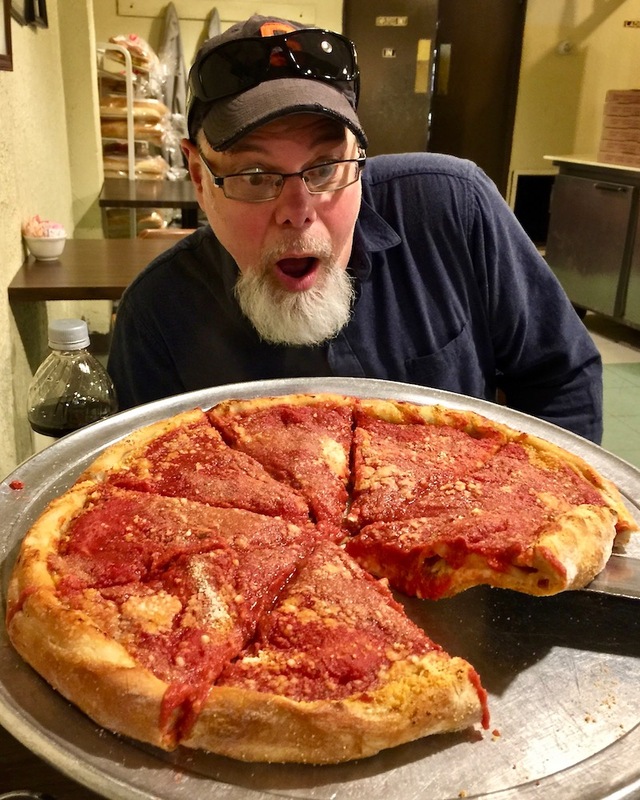 Our Pittsburgh-born Wisconsin-based correspondent Murphy informed us that all of these qualities–the cracker crust, the minced toppings, the hidden edge–are all hallmarks of a more general “midwestern pizza”. Also and very important is the way they slice it, in little squares called “party style” though it doesn’t sound like a party to me when you have nothing solid to grab onto (like, you know, a CRUST). I would like to further note that using non-triangular cuts means that some people might get stuck with a dinky little side piece and others get a weird gloopy middle piece rather than beautifully uniform, foldable triangles. Ouch! Ain’t no law like Murphy’s. Just like we said back in our report on Beto’s, when you bake a fresh pizza, even when it’s bad, it’s still good. That basic fact holds true at Sir Pizza. The legion of devoted “Sir-heads” who line up for the trademark pie and defend it with the zeal of South Hills’ “Betonauts” will disagree, but we’re glad they love their local(-ish) pie. The Orbit remains perplexed, but still curious. Mangia! Pizza has gotten almost totally standardized. 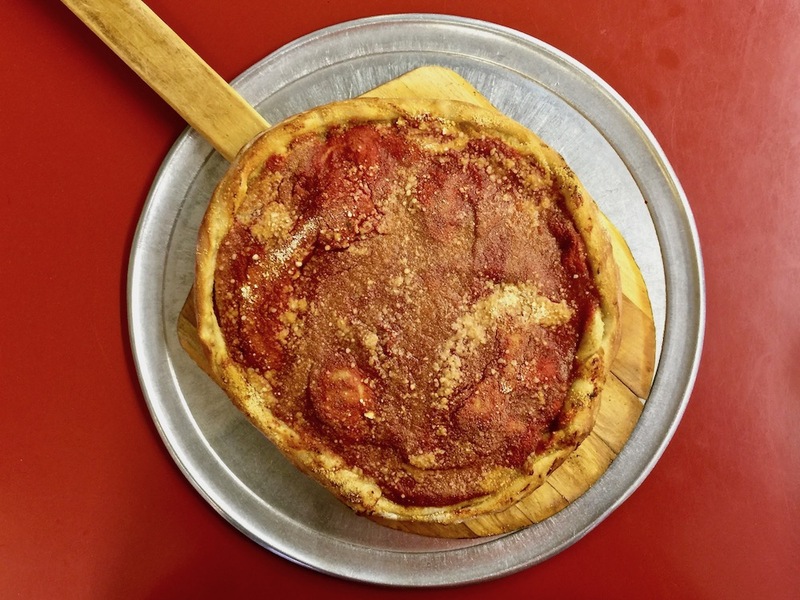 Sure, there’s a couple varieties: New York-style thin-crust and Chicago-style deep dish, square Sicilian, and some fancy places dress theirs up in various ways, but you’ve pretty much seen it before. 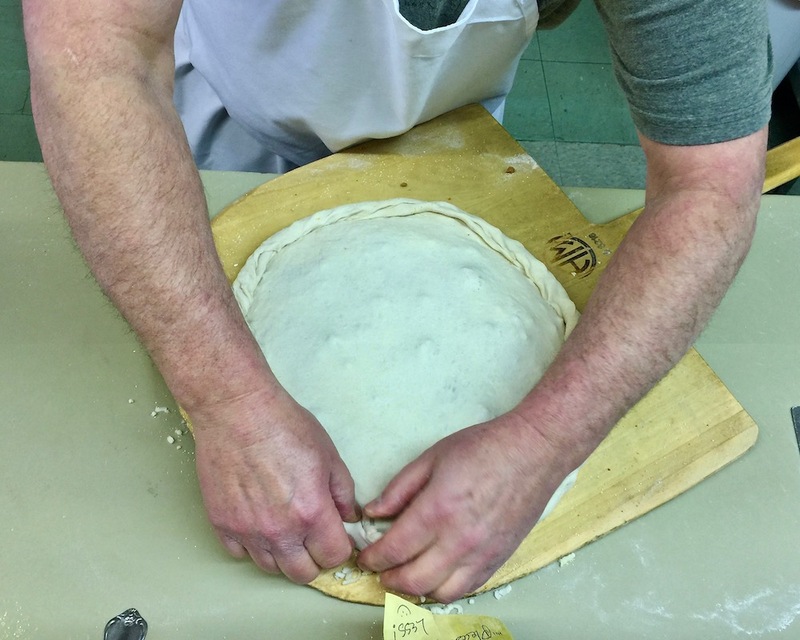 We’ve been collecting stories about Pittsburgh-area pizza houses that do something fundamentally different from any of the above standard configurations. We’re not trying to name the best pizza (although each of these has its super fans); we’re just looking for something that’s truly unique. These will be explored in a new series called The Pizza Chase. 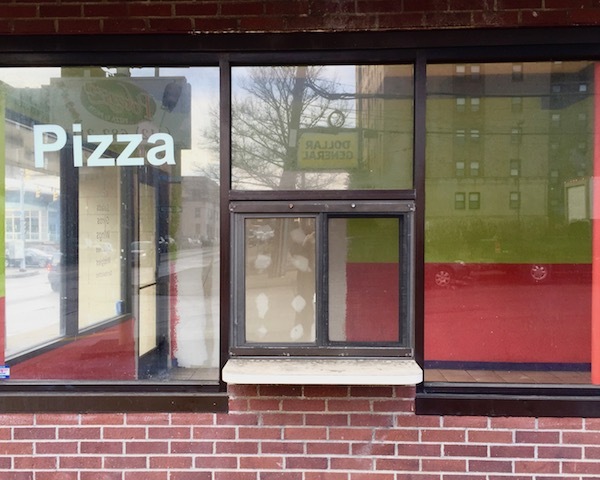 And we’re going to start with Beto’s Pizza of Beechview. First: there are only two denominations of pie: either individual cuts (approximately 4″ square) or an entire 28-cut rectangular “tray”. Nothing round; none of this small/medium/large business. You’re either all-in, or you take it on the run. Second: ordering individual cuts (as almost all customers seem to do) takes exactly the same time as ordering a whole tray. (We were told this by the staff and wound up ordering a tray on our first visit; they speak the truth.) How can that be? Anywhere else, the cuts are ready to go and they just pop them in the oven for a minute to warm them up. Not at Beto’s. What are they doing back there? I don’t know, but they’re not working off the standard playbook. Third: even if you order a full tray, it doesn’t arrive on anything resembling one. The pizza is delivered as seven separate plates, each containing four cuts with an giant halo of post-op mozzarella cascading to the floor. 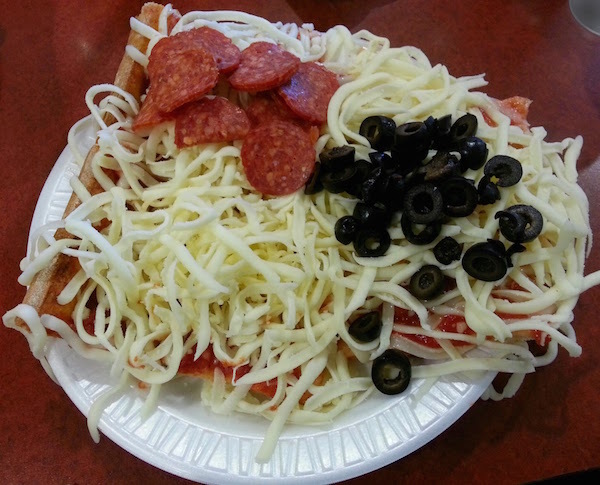 Most jarringly, Beto’s separates itself from other pizzerias by only adding the cheese and toppings after the pizza has left the oven. This bizarre practice produces a hot-on-the-bottom, cold-on-top sensation that is as pleasurable as being in a hot tub while it’s snowing (to its fans) or as disorienting as, uh, being in a hot tub with a big block of ice on your head (to its detractors). After two visits, The Orbit still isn’t sure where it stands on all this. How does it taste? Well, a guy trying to watch his carbs will start by saying that he generally feels like even when pizza is bad, it’s still good. It’s a forbidden fruit, a taboo pleasure to be savored when the occasion presents itself and he’s prepared to put in some extra hill climbs to pay the rent. And so in that sense, Beto’s bi-temperate, sometimes-you-gotta-break-the-rules approach still satisfies. That said, it is this blogger’s belief that eating melted cheese on fresh-baked pizza dough is one of the world’s great carnal pleasures and to eschew this when you’ve got all the tools and ingredients right there seems insane. But I’m here for the ride. To get a handle on all this, we called in an expert. Carrick native Bob Jungkunz has been a Beto’s customer since at least 1975 when his older sister and her boyfriend first introduced the cross-hills Beto’s to her little brother. Bob has been coming to Beto’s ever since and continues to stop in for dinner nearly once a week. Bob swears that the pizza preparation hasn’t changed a bit in the last forty years and went on to detail the old environment. Apparently before the expansion of both the dining room and parking lot, it was common for Beto’s customers to simply eat in their cars in the cramped lot, seating in one of the the handful of tiny booths nearly impossible to secure. Bob describes Beto’s no-cook-topping approach and mild sauce as “subtle” and the overall experience as “very pleasing,” preferring plain cheese, but mixing it up from time-to-time. He also gave us the pro tip that one can order cuts to go and by the time you reach your destination the cold cheese had done its own partial melt from the in-box heat, offering yet another taste and texture option. Bob is not alone. Beto’s dining room is stuffed with cold-topping cut-consuming customers, photos of smiling faces, decades-old news clippings, and mementos of the pizzeria’s fifty-plus-year history. To-go boxes sit pre-folded from counter height to ceiling everywhere you look around the kitchen, prepped and ready for a phalanx of orders. I don’t know if I love it–heck, I don’t know that I like it–but I’m glad it exists. 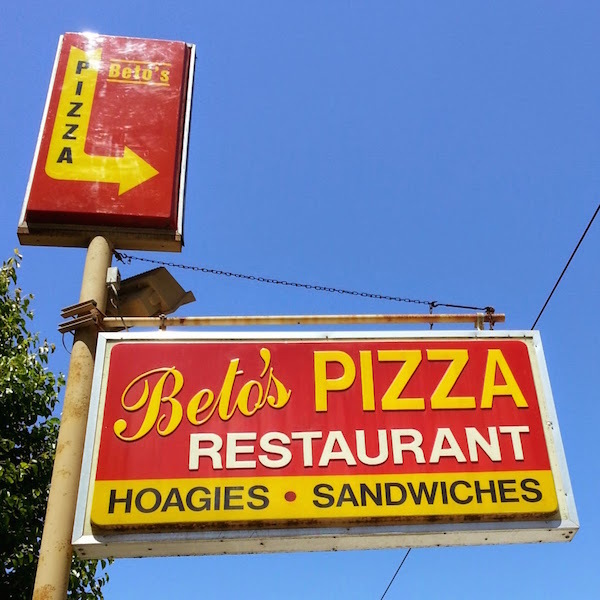 Beto’s Pizza is at 1473 Banksville Road in Beechview.